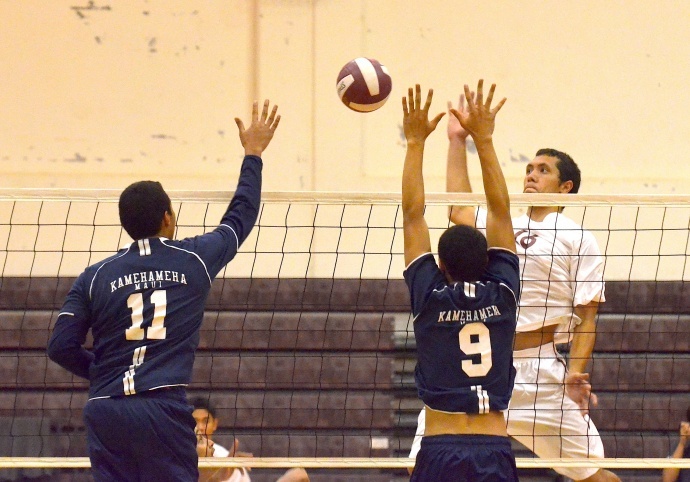 Baldwin’s Bradley Bowlin rips a kill through the block of Kamehameha Maui’s Kolby Ah Sau (11) and Manaloa Aikala (9). Photo by Rodney S. Yap. 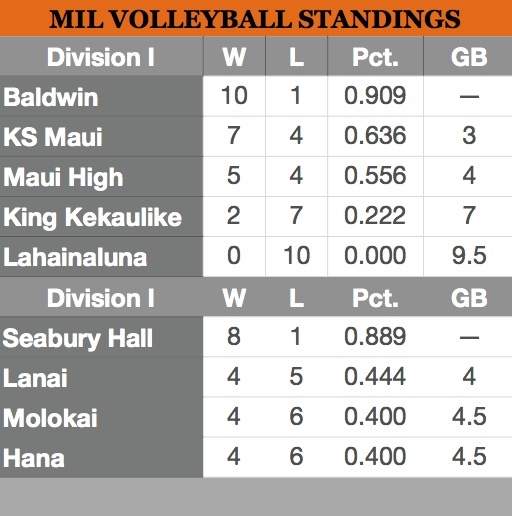 Defined as a work in progress at the start of the season, the Baldwin High School boys volleyball team enjoyed a breakout performance Friday, clinching the 2013 Maui Interscholastic League regular-season title and state Division I tournament berth. The Bears rolled up Kamehameha Maui in four sets, 25-18, 25-10, 20-25, 25-20, to improve their record to 10-1 before a crowd of about 100 at Baldwin’s gymnasium. The Warriors fell to 7-4. Kamehameha Maui’s Kekoa Travis Uyechi goes wide, around the Baldwin block led by Trent Helle (11) and Kyson Kaiama (12). Photo by Rodney S. Yap. Junior outside hitters Niko Corpin and Ryan Garces each had 12 kills for Baldwin. Senior Coren Yamauchi had eight aces and 15 digs playing libero for only the second time. 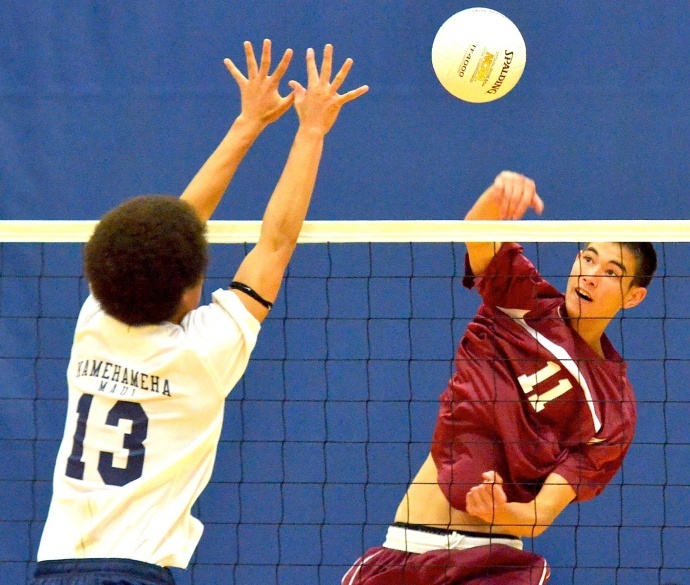 Meanwhile, setter Kyson Kaiama had 37 assists for the Bears. 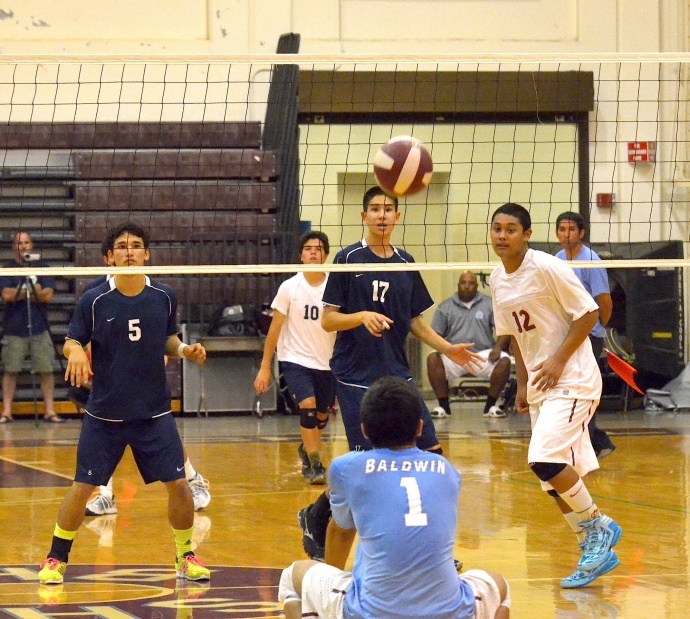 Mana Aikala, Kahiau Andrade and R.J. Moku each had five kills for the Warriors. Kekoa Travis Uyechi and Ionatana Tua had 10 assists apiece. Houpo guided Baldwin to the MIL title two years ago, behind a veteran roster that included the likes of Timmy Pang, Kealii Pacheco and Kona Sarmiento. Houpo said the two biggest contributors to the team’s steady improvement are Corpin, who was on the JV squad in 2012 and is now a captain, and Yamauchi, who due to family issues did not play last season. 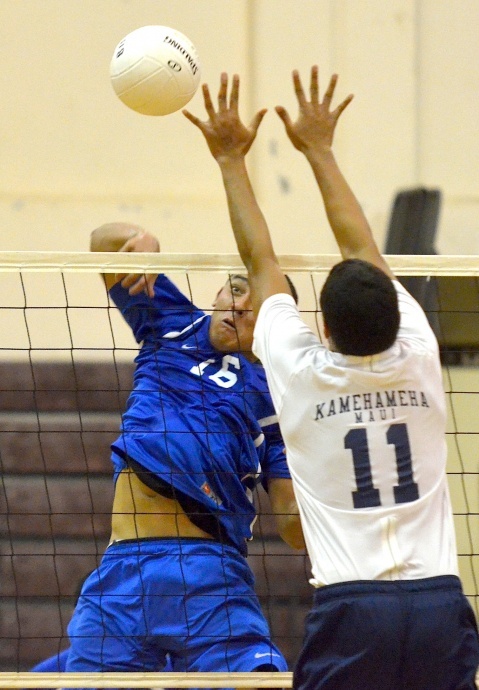 Baldwin libero Coren Yamauchi bends for one of his 15 digs Friday against Kamehameha Maui. Teammate Kyson Kaiama (12), and KS-Maui’s Kawelau Yen (17) and RJ Moku (5) look on. Photo by Rodney S. Yap. Houpo said Yamauchi is arguably the most versatile player on the team. Nevertheless, be it offense or defense, Baldwin’s bread and butter is its pair of 6-foot, 3-inch middle blockers — Trent Helle and Bradley Bowlin. 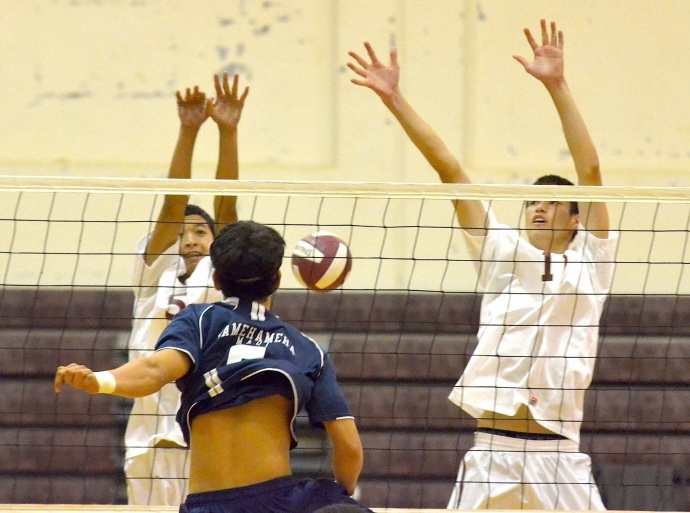 Kamehameha Maui’s RJ Moku spikes a kill shot past Baldwin’s Atreil Tanaka (5) and Trent Helle (11). Photo by Rodney S. Yap. 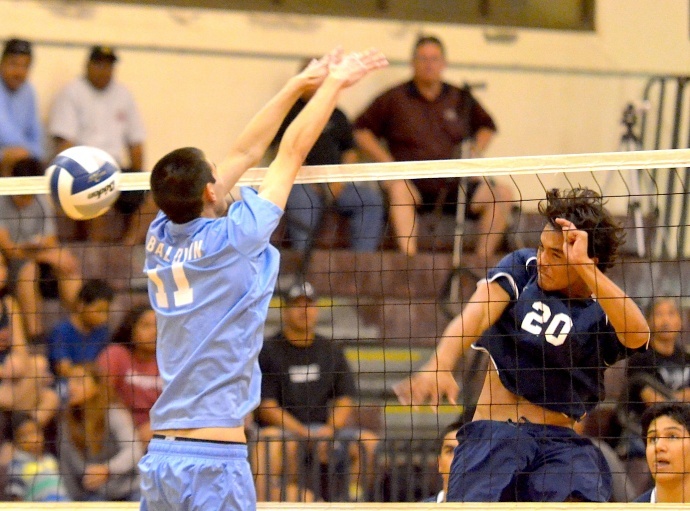 When Kamehameha Maui rallied to go up by as many as 10 points in the third set, which it eventually won 25-18, Houpo deferred to his twin powers in the middle. With the MIL Tournament coming up in two weeks, Houpo said the team needs to stay focused and build on its success. 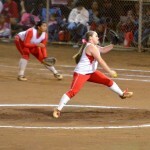 “This team needed a confidence booster. A lot of weight has been lifted off our shoulders. Going into the season we weren’t really thinking about states, we were thinking about getting better and seeing how we were going to progress. Hana swept Lanai at Lanai City, 25-22, 25-19, 25-16. 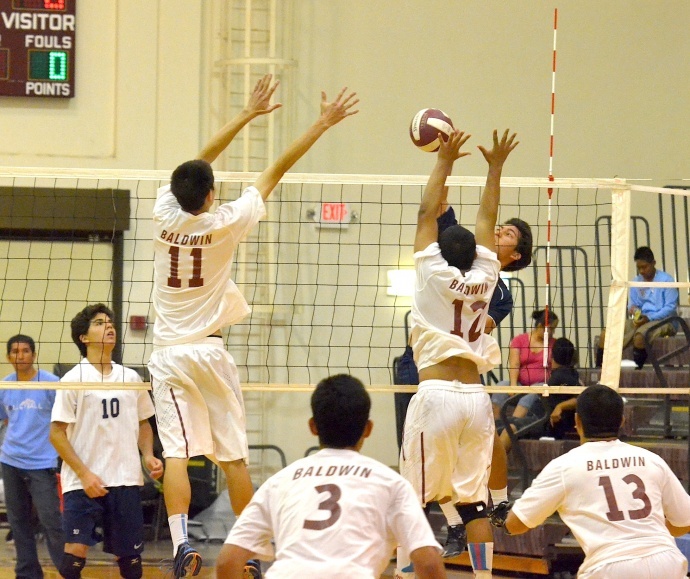 Seabury Hall defeated Molokai at Hoolehua, 21-25, 24-26, 25-22, 25-16, 15-6.